In 1958 the American company McDonnell Aircraft developed the the fighter jet/bomber F-4 Phantom for the US navy aircraft carriers. The F-4 is a large fighter jet and equipped with 2 powerful turbojet engine. The F-4 Phantom has been developed for air superiority, interception, and for close air support. The Phantom is still in service with many air forces, like Germany. In 1962 the F-4C version was developed for the US Air Force. 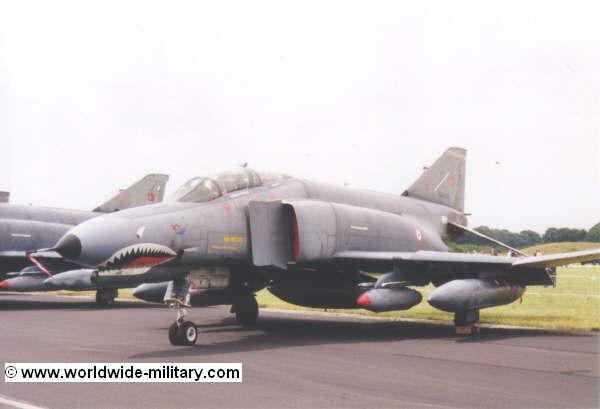 The F-4C have been developed for: air-surface attack, reconnaissance missions and for interception of enemy aircraft artillery. They have been manufactured from 1963 till 1979. The QF-4 Phantom is a converted F-4 Phantom. A few time ago the US Defence has written a few contracts for the delivering of some 200 from these unmanned fighter jets. Usage of these former fighter jets as remote controlled drones gives pilots a realistic target during training missions where live missiles are launched. 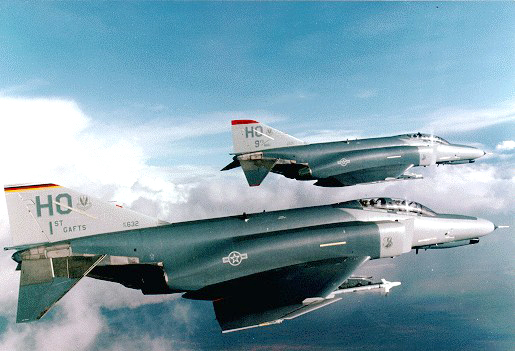 There have been manufactured more than 5000 F-4 phantoms: 2600 for the USAF, 1200 for the US Navy and US Marine Corps and the others for (of that time) allied countries. The users of the F-4 Phantom are the United States (1), Germany (2), Greece (3), Israel, Iran, Spain, Turkey, South-Korea, Australia, Japan and the United-Kingdom. The United States were having the largest fleet with 3800 F-4 fighter jets. The F-4 isn't operational any more but they are in storage. There are absolutely many phantoms still in the US armed forces. The United States Air Force had since 1963 the ability of the F-4C Phantom. The F-4D came operational in 1966 with the USAF. Some later a F-4E version was developed which cam operational with the USAF in 1967, in 1985 with the Air National Guard and in 1987 with the Air Force Reserve. A update of the F-4E is the F-4G Wild Weasel. The F-4 has been used during the Vietnam war and Operation Desert Storm. In the Air Force the F-4 has been replaced by the F-16CJ/DJ. In the navy the F-4 has been replaced by the F-14 Tomcat. The Greece Hellenic Air Force is still using the F-4 Phantom in the F-4 E Phantom II version.